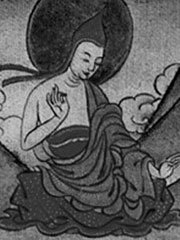 Shantideva (sometimes Santideva) was an 8th-century Indian Buddhist scholar at Nalanda University and an adherent of the Madhyamika philosophy. The Avaivartika Order of Chinese Madhyamika lineage maintains that there were two individuals from the same family who were given the name «Shantideva», the founder of the Avaivartika Sangha in the 6th century and the latter Shantideva who studied at Nalanda in the 8th century. Citations of these archaeological discoveries may be confirmed through, a respected online resource maintained by the Asiatic Society of Bangladesh, or through the , which was founded by the Chan Ssu Lun regent of Avaivartika Order. An English translation of the Sanskrit version of the is available online, as well as in print in a variety of translations, sometimes glossed as A Guide to the Bodhisattva’s Way Of Life or Entering the Path of Enlightenment. It is a long poem describing the process of enlightenment from the first thought to full buddhahood and is still studied by Mahayana and Vajrayana Buddhists today. A new translation and commentary by Pema Chodron is due to be published in 2005. An introduction and commentary to the Bodhicaryavatara by The Dalai Lama called «A Flash of Lightning in the Dark of Night» was printed in 1994.